Submitted by Mike Quigley on 18 August 2010. It is an honour to be here today giving this Charles Todd Memorial Oration in the company of many of Australia?s telecommunications leaders. When, many months ago, I accepted the invitation to speak here today little did I know that it would be just a few days before a Federal election, the outcome of which will have a profound impact on our industry. My conclusion was to take a deep breath and just tell it as I see it? without fear or favour. This is what I did just last week when we made the announcement that we would be providing a 1 Gb/s product. We had been working on this for quite some time and I saw no reason not to follow our usual practice, which was to make the industry aware of our conclusions. We are continuing to do this. So we released our Product Overview documents for our Fibre, Wireless and Satellite products yesterday. Tomorrow we will be releasing a more detailed 80 page technical Product Description document for our Fibre product. 4. why wireless can?t, on its own, serve all our long term broadband needs but a combination of wireless and fibre can. In fact there is an even more fundamental point I would like to address - the veritable elephant in the room, in fact, the ?white elephant? in the room. Even more interestingly, I heard just earlier this week, from a Chinese equipment vendor that China Mobile, the world?s largest mobile operator, is now looking at deploying FTTP. The Overland Telegraph cost ?480,000, equivalent to just under a $1 billion in today?s termsi. The total cost was met entirely by the tax-payers of South Australia and was equivalent to 60% of the state?s annual budget.(ii). This was the first of the three major investments that have been made in Australia?s fixed line telecommunications infrastructure. whose costs are compared in Figure 1. The third major fixed line investment was attempted by the private sector. I am referring of course to the investment in HFC technology by two private companies. So, of the three fixed line infrastructure builds in Australia - two were great successes and were built by the public sector. This is why when it comes to telecoms infrastructure investment we should not accept the simplistic mantra of ?private markets good, public investments bad?. I want to be clear at this point that except for the last 12 months, I have lived my professional life in the private sector in a large commercial telecoms company. I am a great believer in markets and the ability of competition to drive innovation. But that does not mean that I believe there is no place for public sector investment in telecommunications infrastructure. In some cases it is the only way to make the big investments that are critical to our future prosperity. No commercial entity will provide good telecommunications services to everyone across this vast nation of ours without Government intervention of one sort or another. No purely commercial company can take the long term view that is required to build the next fixed line platform that Australia now needs. The Overland Telegraph that Charles Todd built using public funding lasted more than 50 years, the copper CAN that was built using public funds has now lasted more than 60 years. The fibre infrastructure on which the NBN is based, and which the Australian public is now in a position to build, will last for the next 50 years. If you are an executive that has to face the pressures of quarterly earnings calls, it is simply not possible to put the long-term public good as your number one priority. You are paid to represent the shareholders interests. But a publicly funded Telco such as NBN Co can take a very different view. Our very ?raison d?etre?, in NBN Co, is to execute the Government?s policy for broadbanding Australia in the most cost effective way possible ? taking a long term view of the national interest. And I would like to stress that we are a Telco. We are not a Government department. So we have a publicly owned Telco which has been set up to build the next generation of wireline infrastructure for Australia - a fibre network which we can expect to last at least as long as the copper network. So the question is, is it a good use of public financing to build the NBN? I believe the answer to that question is yes. Not only because of the advantages that a national fibre network provides, but because it will simultaneously correct the industry structure problem which has limited the Australian telecom?s landscape for more than a decade. ?My fundamental argument is that we need to get the market structure right first if we do that, the right technology will follow. broadband services ? and they all operate over the same network on equal terms. I think Paul absolutely nailed it with these words, arguing for a single national wholesale only provider. But I understand why people ask the question ? ?How is it that a Government controlled monopoly can improve competition?? My view after spending 36 years in the telecoms industry, and having observed at close quarters access models all around the world, is that an efficiently run, publicly owned, wholesale Telco whose objectives are to maximise the public interest, is a good solution. It is much easier to deliver nation-wide eHealth and remote education services on a standardised and ubiquitous network. On the contrary, it?s rather difficult to deliver these services on a patchwork of technologies - it?s been tried in other countries. The NBN will be a wholesale only network which will provide the underlying broadband capability to all players on equivalent terms. NBN Co is working closely with the ACCC to ensure that the Company is subject to strict regulatory oversight for the long term. As most players in the Telecoms industry in Australia know, we have a fundamental industry structure problem that is finally being addressed with the NBN. This is a major breakthrough. In reaching the 7% of Australia?s premises that are not within the fibre footprint, NBN Co will be providing a 12Mb/s service on wireless and satellite that is as close to the fibre product as technology allows. It will be provided at the same wholesale price, no matter where the premise is located. We are mindful that the costs are significant in serving these more remote customers, and that no commercial company would find this an attractive market. But we take very seriously the objective given to us by the Government, to serve all Australians. We will also be providing connectivity for Retail Service Providers to access an end user in a given region from the same Point of Interconnect, using the same processes, from the same physical network interface and, as I have said, at the same wholesale price. NBN Co is planning for the provision of Uniform National Pricing. That is pricing which is distance and technology independent. We are currently working with Government on the practical application of Uniform National Pricing which is critical for lowering the barriers to entry for Retail Service Providers and delivering effective national retail competition. This, in turn will drive increased levels of retail competition in rural and regional Australia, lowering the cost of doing business for those living and working in those areas. I recently met with the representatives of the National Farmers? Federation (NFF) and the NSW Farmers? Association. Who as you can see from the screen, clearly supported our direction. We are doing everything we can to allow the people living and working in the 7% of premises not covered in the fibre footprint to be provided with the best possible telecom services. Of course this doesn?t come free. It means that the NBN Co business case does not produce the commercial returns that a private investor would demand. That is why it is the Government that is funding this infrastructure build. It never ceases to amaze me that people who should know better, criticise the NBN because it is not going to generate the sort of returns that private investors would be seeking. 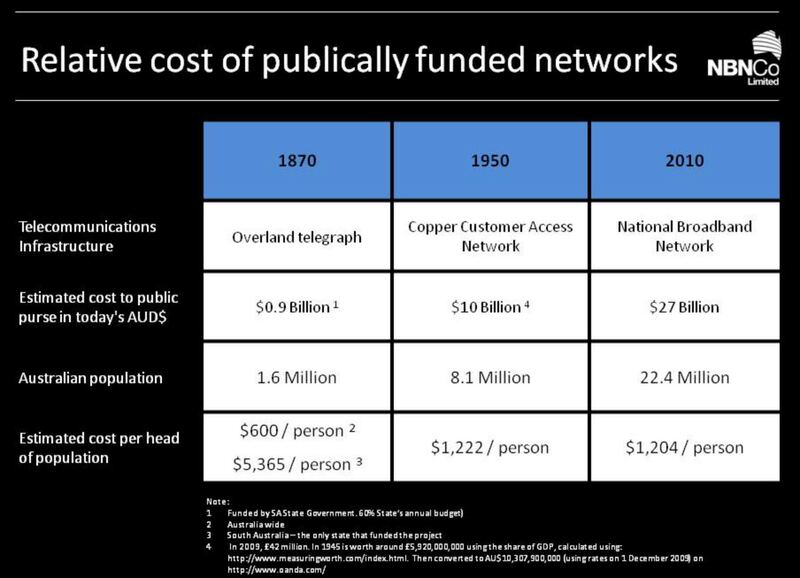 This slide demonstrates the relative cost to the public purse across the three major publicly funded fixed wire infrastructure rollouts. You can see that NBN is very comparable. We, in NBN Co, are also not blinded by the necessity of immediate returns on the public investment in the NBN. But we will be providing a long term return and will be covering our costs relatively quickly. Without factoring in any social, economic or productivity benefits that the NBN will provide, the returns predicted by our business case will be very acceptable to the Government. Our business case requires equity funding by the Government of around $27 billion. This is not the total capital costs, as we expect to raise debt, without Government guarantees, of at least $10 billion. The Telco and Finance professionals within NBN Co that have built this business case are experienced business people who have been involved in running some very large companies and know how to assess risk. So far from being a ?white elephant? the NBN can provide an acceptable return for the Government. Taxpayers will get their $27 billion investment back with interest and they will get a network they can use for decades. This is, I believe, a much better option for the Australian public than giving billions of dollars of taxpayer funding to subsidise commercial companies to marginally improve today?s broadband networks. So what are the risks for the public in financing the NBN? The first thing I would note is that while the NBN has the same nation-building characteristics as the Harbour Bridge or the Snowy Mountains scheme it does not have the same risk of cost over-runs. The satellite and fixed wireless solutions are badly needed to dramatically improve the services that can be provided to rural and remote communities. The transit backhaul build is, I believe, supported by almost everyone in the industry as being a good investment for the country. So the issue is around the FTTP build. One of the concerns I hear is that the costs will blow out. We have come in on time and under budget on our first build in Tasmania and we have some excellent benchmarks for similar builds in overseas markets. Remember this is a highly repeatable build of very similar modules as we rollout across the country. The scope for applying continuous improvement methodologies to drive down costs is huge. The Heads of Agreement with Telstra also reduces uncertainty as we are able to use existing underground ducts. We also expect to dramatically reduce our revenue risk with the Telstra agreement to decommission the copper as our fibre network is rolled out. The other concern I hear is that our revenues are at risk because it will be at that point that there will be a move to wireless on the assumption that wireless will provide everyone?s broadband needs. Overseas data simply doesn?t support this line of argument. You will recall I said earlier, that some of the biggest Telcos in the world are investing in FTTP. What is it that all these Telcos know about wireless that eludes some in Australia? Why is it that you can?t buy anything close to a 50 GByte per month plan on a mobile network? It?s all related to the limitation of wireless as an access technology. So perhaps I should spend a few minutes on the realities of access technologies. Each of these access technologies has its own characteristics with respect to bandwidth (speed), distance dependence, symmetry, latency and coverage. The technology options in Charles Todd?s day or even in the days when the copper CAN was first deployed were considerably simpler. The technology options available today make network design choices quite complex. It is a fact that communications is the field in which some of the most complex and sophisticated applications of modern physics, mathematics and statistics are used. That?s what makes it so fascinating, but also so challenging. Copper: with copper-based DSL we have now reached about the limit of what can be done. It is now a trade-off between distance and speed. We should show our venerable copper plant a great deal of respect. It has served us well for decades and provided us with more than we had any right to expect. It is now time to allow it to gracefully retire. Wireless: we have a lot to thank James Clerk Maxwell for. He unified the physics of electricity and magnetism and predicted the propagation of electromagnetic waves on which wireless systems are based. Mobile technologies will continue to improve and mobile applications and devices will continue to proliferate. However, we need to be realistic. Every cellular base station is fed by fibre ? for a good reason. Spectrum is a very scarce resource which is why, as I said earlier, you cannot buy a mobile broadband plan that will provide a 50GByte/month download capacity. Wireless speeds also depend on distance and load. Coaxial cable: a ?souped up? version of copper. A much higher bandwidth capability but because of the design of HFC systems it has symmetry problems. While it can provide high speeds it is not so good at providing symmetrical broadband services that you need for, for example, two-way videoconferencing. It is also a shared medium so it is load dependent. Of course you can continue to node split, in which case you get closer to a fibre PON (Passive Optical Network) architecture. Satellite: great for broadcast coverage but needs careful engineering to ensure a good broadband service can be supported. It suffers from latency issues since there is not much we can do about the speed of light. Fibre: which is almost the ideal transmission medium. The cable itself is cheap, very robust these days, has negligible latency issues and has an incredible bandwidth capability. The limitation in speed achievable in fibre-based systems are related to the rates at which the electronics on either end of the fibre can switch. The information carrying capacity of the fibre itself is almost unlimited. So, is fibre likely to be superseded in the next few decades by some new technology we have not yet even thought of? To suggest that we not build a fibre-based network in Australia now because maybe some new, but not yet imagined, technology may turn up, displays a rather na?ve view about how science and technology progresses. It is like not investing in rail because we think automobile technology will radically improve sometime soon. It is now time to say a few words about the benefits to Australia of a ubiquitous and standardised broadband platform. Recent studies have noted the substantial annual benefits that flow from broadband in terms of GDPxi. One such study of a fibre access network estimated a US$160 billion economic benefit over 4 yearsxii. This same study estimated an annual increase in jobs of more than 210,000xiii. Productivity growth (labour, manufacturing and technology), national competitiveness and innovation are all a function of access to affordable broadband infrastructure. Blending life between work and home is a modern reality and a key driver of employee retention is workplace flexibility, especially for women. The benefits to national income of boosting full-time female participation rank somewhere above those of tax reform and below those of promoting competition policy.xiv A reasonably good ROI for broadband infrastructure. Our society is both aging and living longerxv. Applications delivered over NBN infrastructure will enable more Australians to live in their own homes longer, with in-home monitoring and high definition video allowing the elderly to communicate regularly with family and health professionals. Providing Australia?s homes with access to affordable broadband infrastructure could lead to a substantial reduction in the number of elderly Australians moving into low dependency aged care facilities. For children at home with serious long term illnesses, high-speed broadband can allow the learning experience to continue. In conclusion, I would like to say that I have much appreciated the opportunity to share with you my views on the NBN. It is the first time to my knowledge that investment in broadband has become such a significant issue in a national election campaign anywhere in the world. It is, I suppose, an indicator of just how important broadband is becoming in our lives. We at NBN Co are very conscious of the fact that we are, on behalf of our Government shareholders, investing a very large sum of money. It?s proper therefore that this nation-building proposal be subjected to the tough questions and to a very rigorous public debate. I?m sure that was the case when the Overland Telegraph and the Copper Access Network were proposed. They would have had their doubters and skeptics and I?m sure Charles Todd had to ? from time to time - defend the Overland Telegraph. However like all debates, this one is best conducted with the benefit of a few facts. And that is what I have sought to do today - place on the record the facts which are driving NBN Co to the positions we are taking. I?m sure Charles Todd would approve. Thank you. xiii Singer, H.J., & West, J.D. (2010), Economic effects of broadband infrastructure deployment and tax incentives for broadband deployment. US: Navigant Economics.